Set in the inspiring glass-vauled atrium of the Paul Hamlyn Hall at the ROH, Flomotion Live was a classy event from start to finish. Nick Luscombe is well known for championing great music, regardless of genre or origin - and Friday's event was no change from standard policy featuring sets by two very different artists: the first a solo-piano performance by Maki Mannami, the second by energetic electro-soul group Little Dragon whose new album Machine Dreams is set to be released later this year. 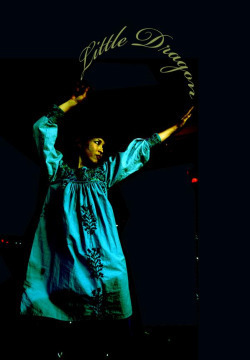 Londonist particularly enjoyed the shoeless dancing, singing and tambourine-playing by Little Dragon front-woman Yukimi Nagano, whose flowing, hypnotic voice matched well with the melodic electronica played by her bandmates. We also noted the ROH's staggeringly reasonable drink prices (for London) and wondered at a world in which it is cheaper to get a beer in an Opera House than a Wetherspoons? Tax subsidies anyone? For more Luscombe eclecticism catch Flomotion Radio online to listen to cutting-edge artists from Nathan Fake to Flying Lotus.